Today's post is a little bit different to our usual posts because we're going to talk about skincare! When I was younger I didn't really care much about skincare. I just resorted to the basics and just did the bare minimum. But as time flew by, I've learnt the importance having a good skincare routine for preventive purposes and it also makes you feel energised and refreshed! Usually, I'm the type that likes to stick to the same skincare routine all the time but its important to actually switch up your skincare every now and then (Fact). This is because your skin may get used to the skincare and it might not be as effective. So the best way is to use one skincare set and finish it off and then switch to another one. If you liked a particular skincare routine, you can always switch back to it after you've finished another set :)! Brigette and I were lucky enough to be sent some skincare products from Clearasil. 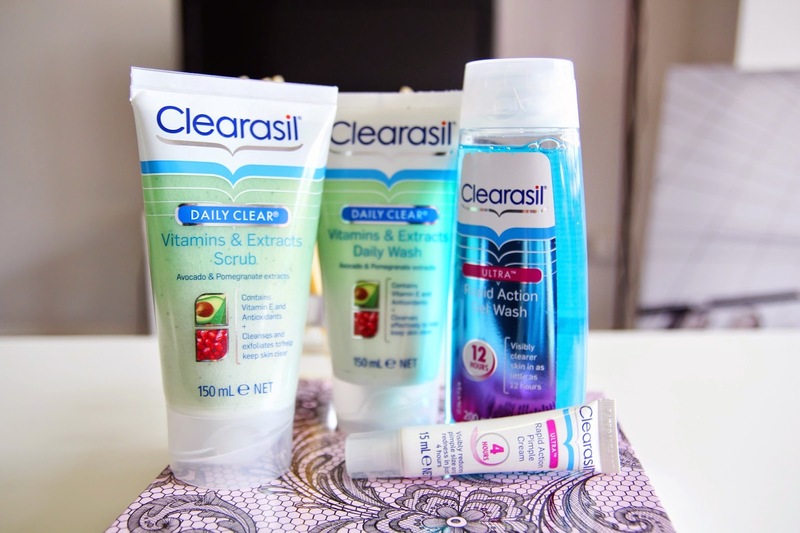 We particularly loved the Clearasil DailyClear Vitamins & Extracts Scrub which is a gentle scrub with little beads for exfoliation. I haven't used many scrubs before but I liked how it was gentle on the skin and that they used avocado and pomegranate extracts in the formula which are known for their skin nourishing properties (yay!). The smell was light and not overpowering like a lot of scrubs are and my skin felt refreshed and cleansed after every use. I have now incorporated it into my skin care routine but instead of using it everyday as recommended, I use it a few times a week so my skin can breathe as well. We were also sent the Clearasil DayClear Vitamins & Extracts Wash and Gel Wash. Both of these provide the same function which is deep cleansing for your face. But I guess depending on your personal preference you can choose whether you like the Wash (which is more of a gentle cream formula) or Gel formula. If you have sensitive skin and prefer washes with a lighter texture then I think these washes are for you :) Click here to view the whole collection of cleanser facial washes available. We were also sent the Clearasil Rapid Action Pimple Cream. Luckily enough, the two of us havent had any pimple issues lately so we didn't get to give it a try ;) but will definately let you guys know how it goes once we give it a go. Anyways, I hope you guys had a lovely Easter Break! I love this brand !